"Would the Wicked Witch kidnap Freddy and force him to make pancakes just for her, or would Freddy escape from her clutches? The adventure began when Freddy became famous far and wide for his delishomposhus pancakes. Did the wicked witch have a name? Where was she from and what became of her? Find out in the sequel to Freddy and his pancakes." Adena J.R. Trevor Adena Trevor was born in England, moved to Scotland when she was four. She lived in Rosyth, Fife, and was educated at Dunfermline High School. She took her Nursing training in The Western General Hospital, Edinburgh this was followed by Midwifery training in London. She emigrated to Canada, worked for the CBC in the Information Services In 1967 moved to Ajax, Ontario where she worked as an RN in Ajax & Pickering General Hospital. When she resigned from A&PGH; she took up holistic nursing which she still does on a part time basis. Adena is married and lives with her husband Stanley, has two sons and three grandchildren. Her Granddaughter, Chelsea drew and painted the pictures for this book. 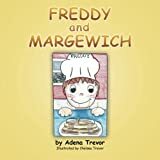 As a young child Adena`s favourite story told to her by her Mother was ?Freddy and the Pancakes?. She never forgot the story and after telling the story to a young patient, was begged to repeat it many times. The little girl never got tired of hearing about ?Freddy and the Pancakes? so now she is telling it to you.